So guys, Say hello to a new frontier for the iPad. As predicted from a long time by rumors, Apple, today, unveiled the iPad Pro at its Sept. 9 event at the Bill Graham Civic Auditorium in San Francisco. It's designed to be used in business environments. The word "PRO" is translated for "Productivity" and more productivity in our views. As it has the largest screen in any iPad version for date. 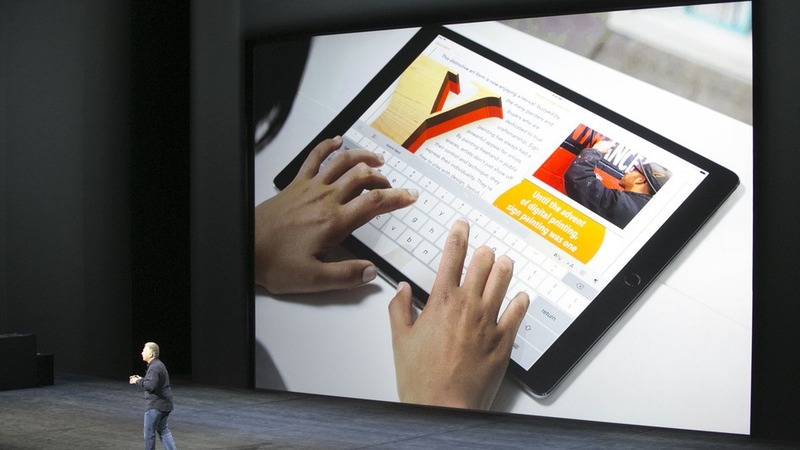 So with its enlarged screen, the iPad Pro is the largest iPad Apple has ever made. It will be an integral part of the company’s push further into the enterprise market, a market where Apple hasn’t had large success. iPad sales have been tapering off over the last few years, so this newer version looks to reverse that trend. The iPad Pro uses a 12.9-inch screen that can display two full-sized portrait apps next to each other in landscape multitasking view. By comparison, the now-diminutive 9.7-inch iPad Air 2 resizes apps when using multitasking view. Battery life is said to last 10-hours. Apple's Senior Vice President of Internet Software and Services, Eddy Cue, teased the larger iPad in a tweet before the event. Internally, the Pro will be equipped with an A9X processor, making it the most powerful iOS device Apple sells, 22-times faster than the original iPad. The new processor is 1.8-times faster than the A8X processor in the iPad Air 2. 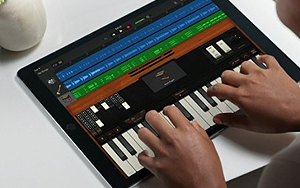 With the Pro, Apple debuted a new Microsoft Surface-like Smart Keyboard, just for the iPad Pro. Also with the iPad, Apple debuted a stylus for the iPad Pro called the Pencil. In terms of size, the Pro weighs 1.57 pounds, which is only slightly heavier than the original iPad. Thickness is 6.9 mm, just 0.8 mm thicker than the iPad Air 2. If you want the best iPad you can get, it'll cost $799 for the 32 GB model, $949 for the 128 GB and $1079 for the 128 GB LTE-equipped model. The pencil stylus will be $99, and the keyboard will be $169.